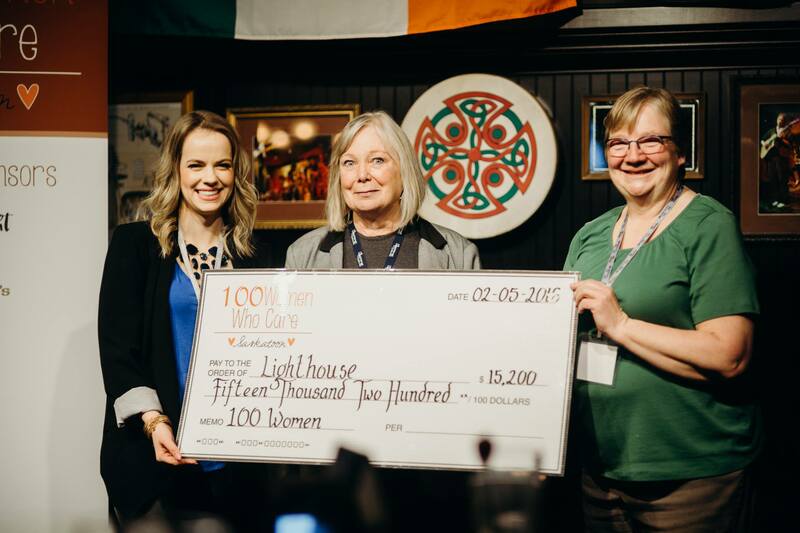 100 Women Who Care is a community of women who meet 4 times a year. About a month before the meeting, members can nominate a non-profit organization for funding. Three nominations are then drawn out of a hat and offered a chance to present at the next meeting. At the meeting, members hear a short presentation from each of the three nominated non-profits, and then the members vote by secret ballot. Whichever organization gets the most votes, wins. What do they win? Every member donates $100 to them! This was only my second meeting, and I was so happy that my nominated organization, The Lighthouse Supported Living, was chosen as one of the three to present, and then received the most votes. What a fantastic way to raise money! With four meetings a year, and a $100 donation each time (whether or not you can make it to the meeting), it works out to donating $400/year. That’s less than $8 a week! And yes, you do get a tax receipt for each donation. If you would like to join this amazing community of women, check out their website – 100 Women Who Care. Or if you want to know more, just ask me – I love to talk about them! There is also a men’s group – 100 Men Who Give a Damn. AND a kid’s group for ages 5-17 (who donate $10 each at their meetings) – 100 Kids Who Care.